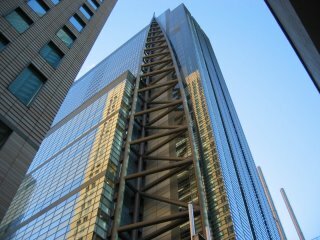 The photo above was taken in the Shiodome area of Tokyo. The building in the photo is an office building, which also houses one of Japan's major TV networks, Nippon television. The Shiodome area used to be the site of the original Shimbashi (train) Station. The current Shimbashi Station is located within a short distance of Shiodome. Shiodome also used to be a freight terminal before it was redeveloped into it's current state. There are many new buildings, hotels, and shops in this area. For a better explanation take a look at this link to a page from japan-guide.com. Shiodome really is a great place to hangout. It isn't as busy as many other shopping areas in Tokyo. Today I thought I would start posting photos in the larger sized format. This blog really is just a photo blog of sorts. Sometimes I feel like commenting on Japan, but I worry that I might start complaining too much, so I think it might be better to keep this blog as it is. My tag line says it all "A Love-Hate Relationship." Anyway if someone has any photo requests, especially of the Tokyo area, let me know. I will do my best to fulfill any requests! I have thousands of photos that I have taken in the Tokyo area. Update: Well, changed my mind and decided to go back to the smaller sized photo.